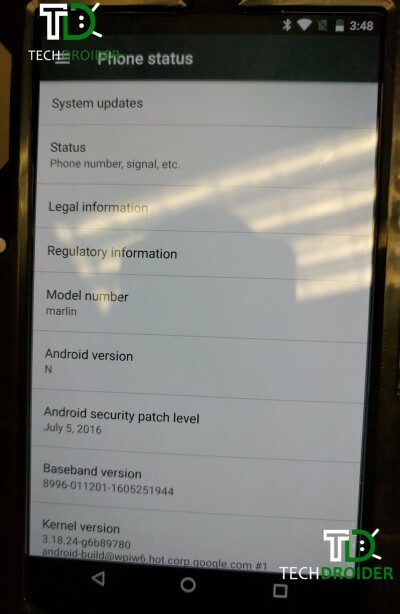 As expected after so long speculation and rumors first alleged image of new upcoming nexus device has appeared online. The sources claiming this device is being manufactured by HTC and codenamed as "Marlin" . Check out the image below. 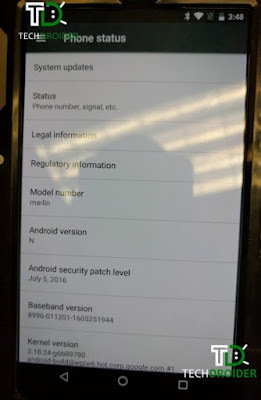 As we can see in image above this device is running on latest version of Android that is Android N having model number Marlin. Beside this Marlin is also having latest patch of July 2016. This device is covered by a case. Beside the image is also not having good lighting condition to hide the origin of that image. As per the sources this device have flagship like specs. In terms of display device have 5.5 inches screen with QHD resolution. Running Android N supported with 4 GB RAM and 128 GB internal memory. Marlin will be rumored to have Quad core Qualcomm Snapdragon chip probably 82X series. Device is rumored to have full metallic body integrated with 12 MP rear and 8MP front camera using the sensor used in Nexus 6P along with same fingerprint scanner as HTC 10. Device is backed by 3450 mAh battery for longer battery life. This seems to be the best of Nexus device coming up so far. Till now we do not have any pricing and release date information. Let's see what Google has reserved for us in future. We will keep you update as we receive it. Stay tuned for more. Thank you for reading.